YouTube Play, billed as the first biennial of creative videos, has released its shortlist of 125 videos, selected from more than 23,000 submissions from 91 countries on the YouTube Play channel. The jury, including musician/video artist Laurie Anderson, graphic design guru Stefan Sagmeister, artists Marilyn Minter and Takashi Murakami, will whittle this shortlist down to 20 videos to be shown in kiosks at the Solomon R. Guggenheim Museum in New York from October 21-24, with simultaneous presentations at the Guggenheim museums in Berlin, Bilbao, and Venice. The Guggenheim exhibition is being sponsored by HP and Intel. JeanBaptisteM – Why Do Things Get In a Muddle? PinkyShow – We Love Musuems – Do Museums Love Us Back? The Guggenheim jury are Laurie Anderson, Animal Collective, featuring Deakin (Josh Dibb), Geologist (Brian Weitz), and Panda Bear (Noah Lennox), Darren Aronofsky, Douglas Gordon, Ryan McGinley, Marilyn Minter, Takashi Murakami, Shirin Neshat, Stefan Sagmeister, Apichatpong Weerasethakul, and Nancy Spector, Jury Chair. 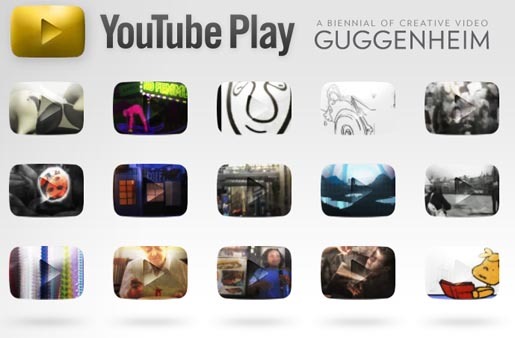 See more on the Play Biennial Youtube channel and Guggenheim YouTube channel.